Edraw Max includes a set of standard chart templates which are smart, interactive and vector-based. 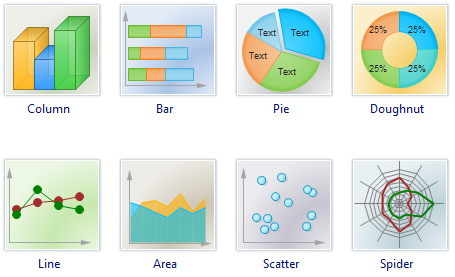 You can change the chart symbols' appearance, style and color according to your requirement. Column charts show data changes over a period of time or illustrates comparisons among items. Clustered column compares values according to categories. Cylinder column is available with a cylinder style in the column. Stacked column shows the relationship of individual items to the whole, comparing the contribution of each value to a total across categories. 100% stacked column compares the percentage each value contributes to a total according to categories. Stacked bar shows the relationship between individual items to the whole. 100 % stacked bar compares the percentage each value contributes to a total across categories. Line chart shows trends in data at equal intervals. Line displays trends over time or categories. It is available with markers displayed at each data value. Stacked line states the trend of the contribution of each value over time or categories. 100% stacked line shows the trend of the percentage each value contributes over time or categories. Stacked area demonstrates the trend of the contribution of each value over time or categories. 100% stacked area shows the trend of the percentage each value contributes over time or categories. Pie displays the contribution of each value to a total. It always shows only one data series and is useful when you want to emphasize a significant element in the data. 3D pie is available with a 3-D visual effect, as shown in the following chart. Multi-Pie presents the contribution of each value to a total while emphasizing individual value. Pie of pie is a pie chart with user-defined values extracted and combined into a second pie. Doughnut chart shows the relationship of parts to a whole; however, it can contain more than one data series. Doughnut displays data in rings, where each ring represents a data series. Multi-level doughnut is like an exploded pie chart, but it can contain more than one data series. Scatter compares pairs of values. For example, the following scatter chart shows uneven intervals of two sets of data. Spider chart compares the aggregate values of a number of data series. Spider displays changes in values relative to a center point. It can be displayed with markers for each data point. Area spider chart covered by a data series is filled with a color. Circular gauge is commonly used in the form of compasses, stop watches, clocks or speedometers. Linear gauge is widely used in the form of thermometers or progress tracking devices. Histogram is a graphic representation of frequency distribution; heights of the bars represent observed frequencies. Offers some ready-made histogram templates for head start to create amazing histograms.